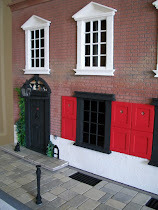 I had a marvellous time at the weekend visiting friends and attending Miniatura. My purchases don't look a lot but I've divided the haul up under my other blogs. I'm not sure about the table as it's not a replica of the original. I'm still thinking about that one. The quadrant is to finish off the panelling in the Green Room and the little timer is for that room also. The knife (from Danny Shotton - I always have to purchase something from him, his stuff is marvellous) and the sharp pointy tool is for my Cobbler who resides in the roof space. He's also getting the little non-working cruisie lamp. Some great little finds there Irene! Hope you had agood weekend with your friends and enjoyed the show. Danny Shotton does have some amazing miniatures, I've been thinking of buying some little cotton spool and the holder to go in my pub living room, but have to get some furniture in there first!! Hello Andy, This is a crusie lamp: http://www.aberdeenquest.com/Artwork/CrusieLamp.asp?timeline=1800_1900_Home This probably explains it better than me! They would have been made by the local blacksmith. I have five working cruisie lamps dotted around The Tenement which I had to commission. Thanks Irene, just had a look, I bet those things reeked!! we all take electric light so much for granted don't we! Glad you had a good time and you got some lovely items Irene - Danny Shotton makes amazing minis. Me alegro que hayas pasado un feliz fin de semana, son unas fantasticas compras enhorabuena!!! I knew you would find interesting miniatures at the fair. Great purchases! Oh, I LOVE the Hour glass, Irene! And little knives that look real are special! The last room in The Tenement will be for a Cobbler so I'm busy research all relevant tools so it seemed fair to start with a knife and a pointy thing! 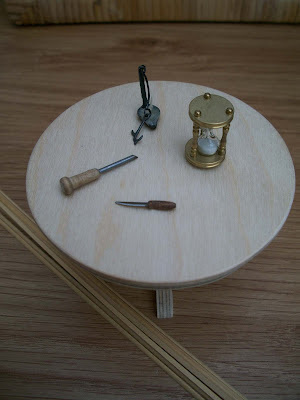 The hour glass is for a desk I've get to make (not a kit - which could turn could turn out interesting!) but the little lamp, I just love.